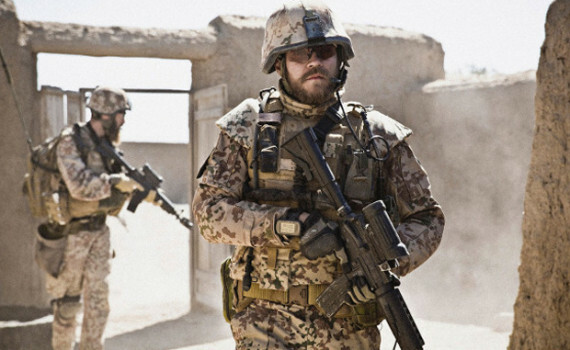 Up for a Best Foreign Language Film Oscar this year is A War, a Danish drama focusing on the difficult life of a soldier & his family as he serves a tour of duty in Afghanistan. As Americans, we’re used to seeing war movies; the guts, the glory, the guns. And we’ve become used to New Age war movies; the tan camo, the desert, the RPGs, the suicide bombers, the snipers, the translators, the terrorism. Bradley Cooper & Mark Wahlberg & Jeremy Renner have all showed us what war in the Middle East in like, or so we think, and perhaps we’ve even become desensitized to the violence there, now that it’s become Hollywood mainstream. But A War paints a different picture, reminds us that we’re not the only ones fighting, that every soldier is simply a human being who often makes bad decisions, and that war is still, at its core, hell. Claus Pedersen is a commanding officer from Denmark who leads a squad of soldiers in the hills of war-torn Afghanistan. His team’s mission is to keep the peace, protect the innocent, practice routine patrols, show their friendly presence in the area, and, when necessary, drive off & kill Taliban agents who inhabit the region. After a patrol leads to the death of a young soldier, and after helping a nearby village causes increased violence, Claus and his unit are on high alert and on edge, with the constant threat of death weighing on their shoulders every day. One quick decision in the heat of battle will soon cause Pedersen more trouble than he bargained for, putting he & his men in danger of court-martial and dishonorable discharge. War is never simple, as this commander and his family soon find out, and sometimes the most noble deed can be your downfall. This is a war movie like none other and one of the best overall films of the year, foreign or otherwise. Given a new perspective, the genre gets a refresh from a movie that approaches the subject from a different angle, that turns war into people, that shows how every action has a consequence, and how those consequences aren’t always proportionate. It’s striking what is acceptable during wartime and what is not, this film giving that juxtaposition a frightening face and bringing that idea to life in a way I’ve never seen before. Using almost no music whatsoever, the action unfolds one sequential step after another, taking realism to a whole new level. While also focusing on the lives of those the soldiers leave behind, A War quickly becomes a film that captures the grand evils & quiet triumphs of a terrible landscape where simple men must make life-altering choices. Not only should it win Best Foreign Film, but this movie deserves to be in the conversation for Best Picture, one of my Top Ten of the year.